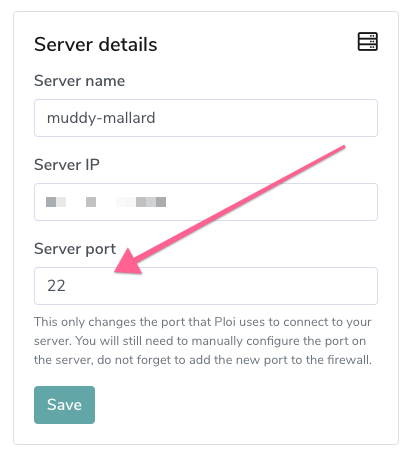 Ploi allows you to manage your server with another port than 22. In this article we will explain how to do this without any troubles. Make sure you portforward your new port, this is really important otherwise you'll lock yourself out the server. So make sure you forward the new port first (SSH is a TCP port). You can do this by going to your server and select the "Network" tab, under here you can add the new SSH port. Login to the root user. If you do not know how read this article: How do I login as root user? Change the port here to the port you desired and forwarded. Now restart SSH service: service ssh restart. Thats it, your SSH port is now changed and Ploi will keep on functioning!